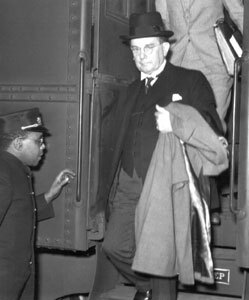 Senator McKellar arrives in Nashville for Unit Bill Fight, 1937. Kenneth D. McKellar, influential mid-twentieth-century U.S. senator, was born in Dallas County, Alabama, on January 29, 1869. Young McKellar was schooled by an older sister and his parents before his father died when the boy was eleven. Working at different jobs, borrowing money, and with help from an older brother, he earned three degrees from the University of Alabama. Soon, along with most of his siblings–he was the fifth of nine children–he moved to Memphis, where he began to practice law. At once interested in politics and civic affairs, McKellar was part of a group of young Democrats who organized the Jackson Club, and it was during these years that he formed his long political and personal association with Memphis political leader Edward H. Crump. With their allies, the Crump-McKellar tandem would form one of the most powerful political teams in the history of Tennessee. In 1911 McKellar was elected to fill the unexpired term of Representative George W. Gordon of Tennessee’s Tenth Congressional District. He was reelected in 1912 and 1914. With Democrat majorities in the House of Representatives and with Southern Democrats in both houses of Congress enjoying their greatest influence in national affairs since before the Civil War, McKellar began his congressional career at an opportune time. Even as a short-timer in Congress, McKellar in 1916 persuaded President Woodrow Wilson to support federal highway legislation which distributed $75 million of federal funds to the states. McKellar had already found his formula for political success–using federal money to promote economic development in the states, especially Tennessee. In time, control over the jobs that came with the money became a major preoccupation of the patronage-minded Memphian. As a member of the House, McKellar supported the constitutional amendment which provided for the popular election of U.S. senators, and he became one of its first beneficiaries. In the 1916 Senate race in Tennessee, he not only defeated both incumbent Senator Luke Lea and former Governor Malcolm Patterson in the Democratic primary, but he then defeated former Republican Governor Ben Hooper in the general election. This was the beginning of a long and often stormy senatorial career for McKellar, the only Tennessean ever elected to six terms in the U.S. Senate. In his first years in the Senate, McKellar supported President Wilson’s progressive reform program as well as the president’s unsuccessful attempt to convince the Senate to ratify the Treaty of Versailles after World War I. During the Republican-dominated 1920s, McKellar continued to support progressive legislation that usually failed in Congress while insisting that despite the nation’s general prosperity, Tennessee and the South needed federal economic aid. However, McKellar, who first won reelection in 1922 and then defeated House Democratic leader Finis Garrett in a spirited primary in 1928, primarily used these years to build his seniority in a system which has always favored longevity in office. These years proved profitable for McKellar when the Democrats won in 1932 and President Franklin D. Roosevelt launched the New Deal the following year. With his seniority as chairman of the Senate Committee on Post Office and Post Roads and as a ranking member of the Senate Appropriations Committee, McKellar controlled countless jobs through federal programs which operated during the New Deal and World War II. Loyal to the New Deal program, McKellar supported federal aid for farmers, New Deal relief programs, and, of course, he helped lead the fight in Congress for the Tennessee Valley Authority (TVA) Act in 1933. McKellar’s considerable success in Washington was matched by that back home in Tennessee. From the mid-1930s to the late 1940s, the Crump-McKellar political machine rolled from one political victory to another. McKellar was reelected in 1934 and 1940 with little opposition, and few in the state questioned his considerable political strengths. At the same time, McKellar increasingly took conservative stands on major policy issues as the years passed and became personally irascible. He began to differ with FDR over patronage matters, TVA operations, and several of the president’s top-level appointments. The split became such that only weeks before he died in 1945, President Roosevelt asked Crump to withdraw his support from McKellar in 1946, a request that Crump refused to honor. After the war, McKellar’s position in the Senate remained secure. He headed the powerful Senate Appropriations Committee and for several years was the Senate president pro tempore. But at the same time, he spent less and less time in Tennessee, and, always prone to confrontational politics, squandered opportunities in feuds with political foes that distracted him from more useful political pursuits. In the early years of McCarthyism, McKellar often opposed presidential nominees on the basis of their political and social associations. Against his friend Crump’s advice and weakened by the machine’s political losses in 1948, McKellar was defeated four years later in the Democratic primary by Congressman Albert Gore Sr.
A lifelong bachelor, the aging McKellar then retired to his suite at the Gayoso Hotel in Memphis, where he died on October 25, 1957. He is buried in Elmwood Cemetery there and his papers are housed in the Memphis-Shelby County Library.